Ruth and Hans Ullrich was a German couple that was very popular in the tattoo world during the 1940s and 1950s. They corresponded with tattoo artists and fans around the world. 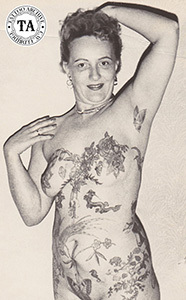 Hans Ullrich was a tattooist and tattooed his wife, Ruth. They were both members of the International Tattoo Club of America (TCA). The Tattoo Club of America's July 1964 newsletter published the following obituary for Ruth: Ruth Ullrich of Bielefeld, Germany, wife of the late tattooer Hans Ullrich, and president of the Germany Ladies' Tattoo Club, died in April. Ruth Ullrich was also a proud member the Butterfly Club.